This FREE No Prep Speech Kites craft for multisyllabic words will make such a fun addition to your bank of therapy activities! 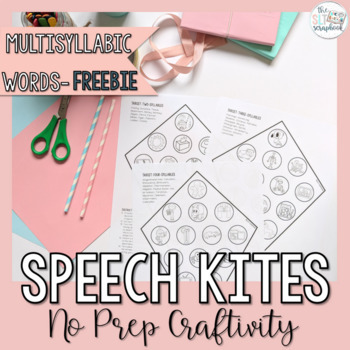 Have fun practicing speech sounds, crafting and flying kites with 3 pages of activities, covering multisyllabic words (one page each for 2, 3 and 4 syllable words). There are 14 targets for each sound/position. Please note, if you have purchased this bundle already, please do not buy this pack as you will already own it. Thank you. Print the desired pages, then grab crayons, scissors, straws, string and tape, and you’re all set! Making the kite is really easy too and there are picture instructions provided. This pack is great for Speech and Language Therapy sessions all year young! It is ideal for homework too, as all instructions and targets are included on each page!